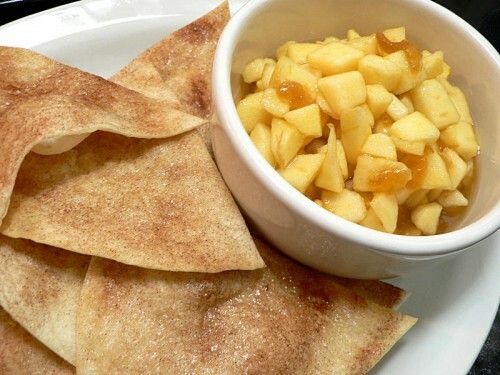 I love apple pie, but sometimes I don’t want a huge piece. Don’t tell me to just cut a small piece, have you ever tried to do that? All the filling falls out and you end up with a sad looking piece of crust sitting next to a pile of cooked apples. Sure, it tastes the same, but it looks bad. But … what if you could get that same taste without starting with a whole pie? Now we’re talkin’. Juice the lemon. Peel the apples and dice small. 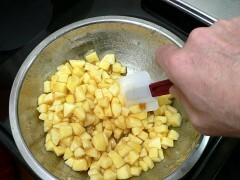 Combine the apples and lemon juice and stir. Add the brown sugar and apricot preserves and stir. Put the bowl in the fridge. At this point it’s basically done. Yay for simple. Cut the tortillas* like a six-slice pizza. 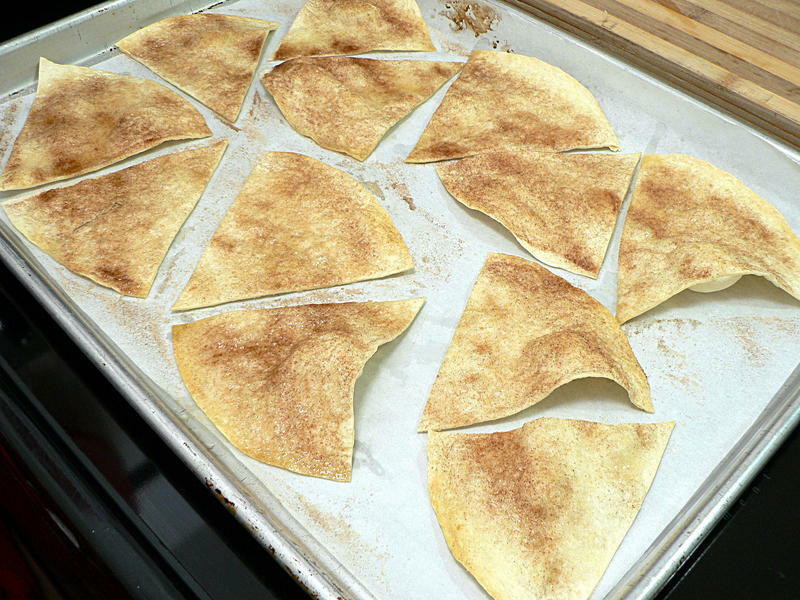 Spread the pieces out on a baking sheet. (I used parchment to make cleanup easier, but they shouldn’t stick to a dry pan.) 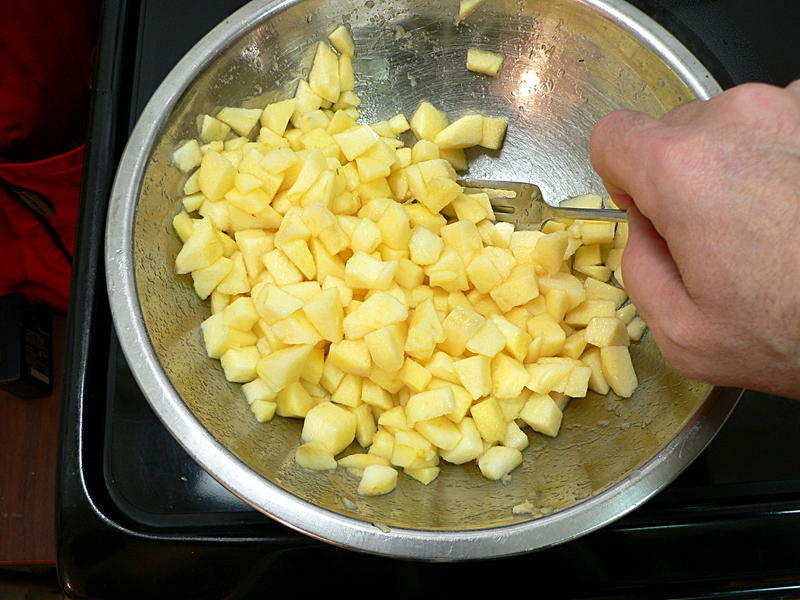 Brush them with melted butter. 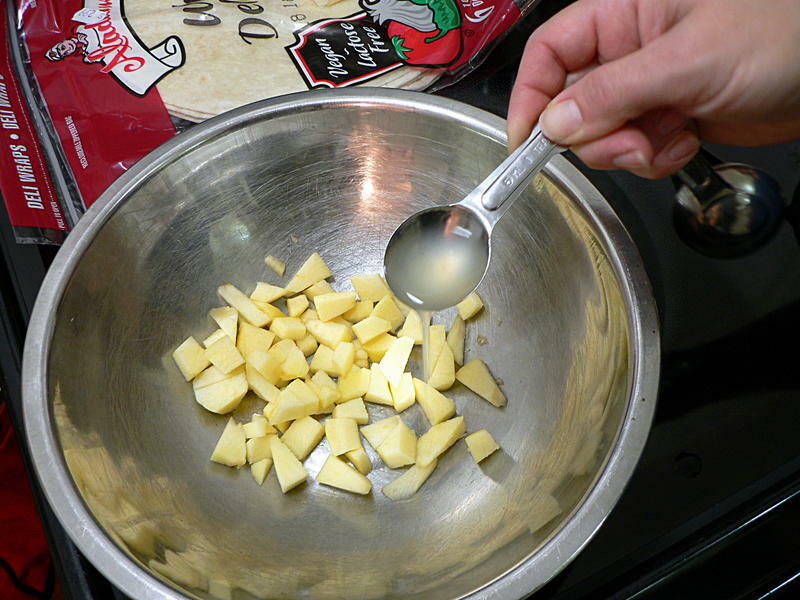 About two tablespoons was enough for four 10-inch tortillas. 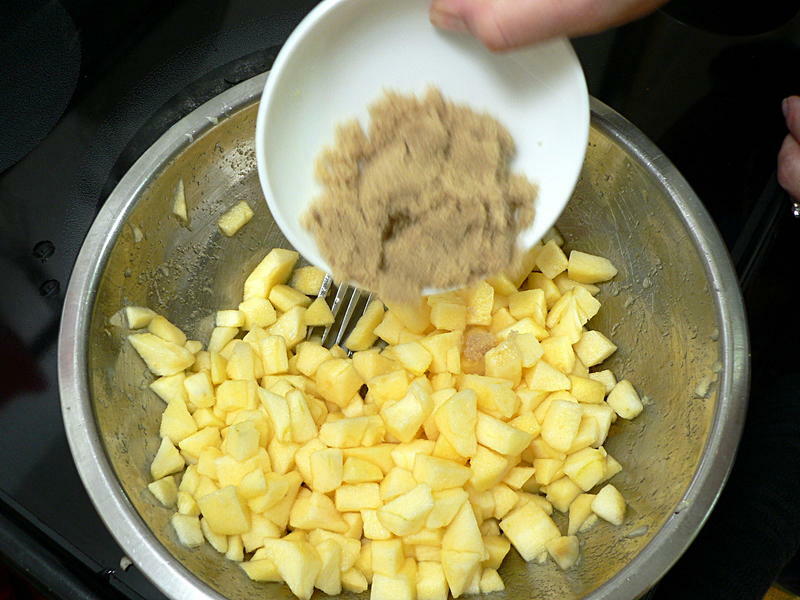 Sprinkle them with a cinnamon/sugar mixture. You can make your own with about 2 tablespoons of sugar to 1 teaspoon of ground cinnamon. My wife likes these pre-mixed shakers. 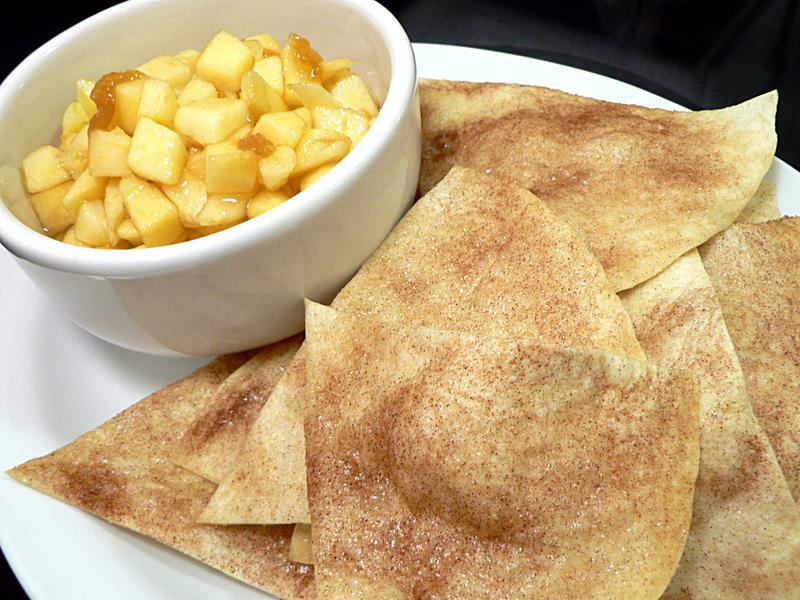 All they’ve got is sugar and cinnamon – exactly the ingredients she would use – but the container is easy for even our 3-year-old to handle without making a mess. 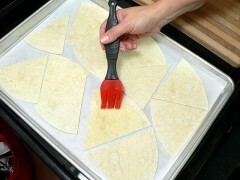 Bake the tortillas until lightly browned, about 7-10 minutes at 450° or 15-20 minutes at 350°. Why the big range and two temperature suggestions? Tortillas are very thin, so they can go from “almost done” to “aww dammit” pretty quickly. The lower temperature is easier to control, but every time you open the oven to check you let all the heat out and add another two minutes to the cooking time. … and the chips next to that. 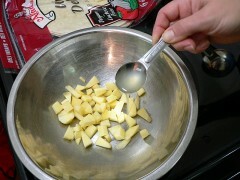 * The 10-inch tortillas I used produced really big “restaurant-style” chips. You could easily use smaller ones, but I wouldn’t go much bigger. 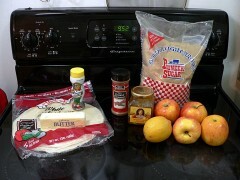 Also, feel free to make your own tortillas. Juice the lemon. Peel and dice the apples. Combine apples and lemon juice. 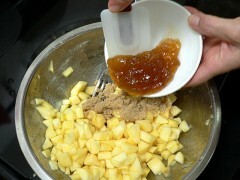 Add apricot preserves and brown sugar and stir. Refrigerate until ready to serve. 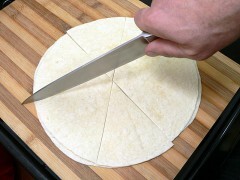 Slice the tortillas into six pieces, like a pizza. 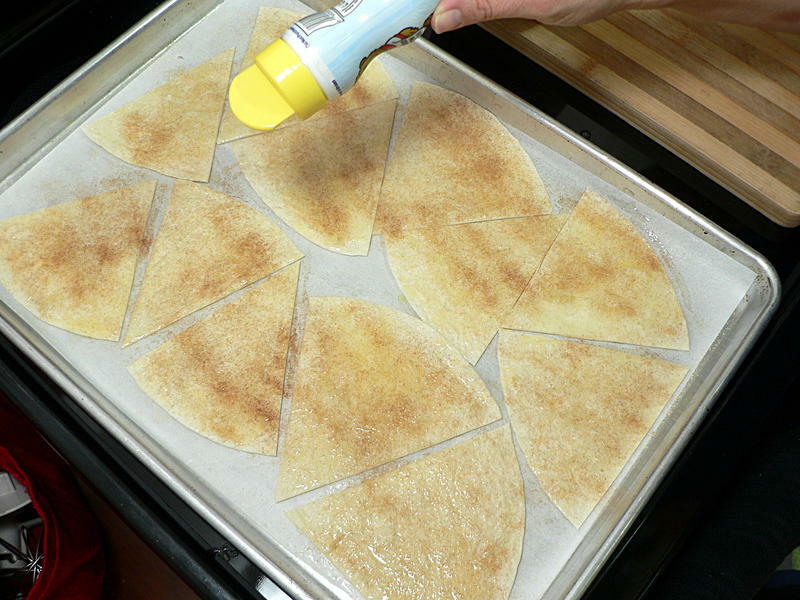 Arrange on a dry baking sheet. (Use parchment paper to ease clean-up.) Brush with melted butter. 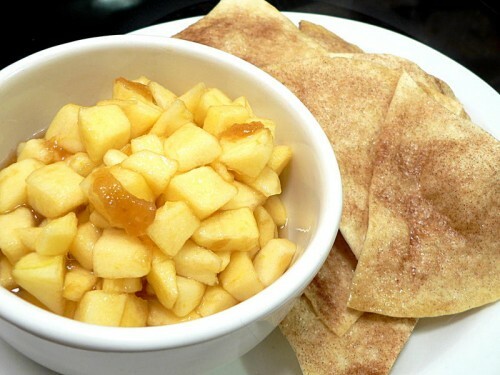 Sprinkle with cinnamon/sugar mix. Bake until golden brown, about 7-10 minutes at 450°.